Graduate students may benefit if more homeowners rent out spare rooms. 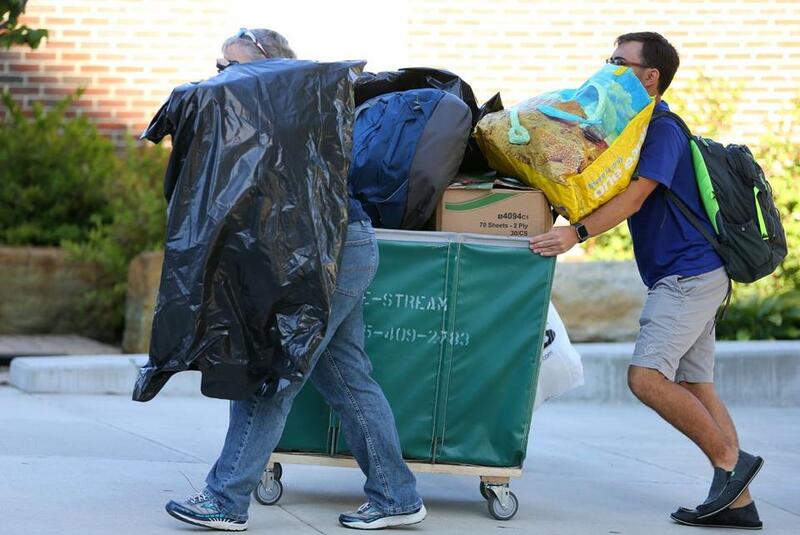 Above, a scene from the annual college move-in weekend. One way to offset some of the side effects of Boston’s building boom — like tenant displacement and a proliferation of illegal apartments — may lie within its existing housing stock, officials say. Two new city programs are aimed at encouraging homeowners to create apartments in their own homes, allowing them to supplement their incomes while helping the city make headway in its efforts to create more affordable housing units. One program — already in the pilot stage — helps match older homeowners who have spare bedrooms with graduate students, with rents that would be significantly less than for an apartment. The other is a proposal to allow residents to build additional dwelling units within the footprint of their home that they could rent without having to go through a mandatory special zoning permit process. While rents in the city are not surging as quickly as they were a couple of years ago, they are still rising. In August, the median monthly rent was $2,365, a 2.3 percent increase compared with the same time last year, according to real estate website Zillow. The program allowing graduate students to rent rooms from empty-nesters — dubbed the Intergenerational Homeshare Pilot — is being tested with a small group of homeowners and is scheduled to run through December. After that, city officials will determine whether it should be expanded citywide. The pilot’s participants were chosen from more than 80 applications received through a partnership with nesterly, an online service founded by two MIT graduates that matches students with seniors who have spare bedrooms. Mayor Martin J. Walsh said the program also will benefit older residents with rooms to spare. Citing a report from real estate site Trulia, Walsh’s office said Boston’s baby boomers have more than 38,000 bedrooms that could be rented out to help them generate additional income. For students, that would mean being able to rent a room for about $600 a month, city housing officials said. The other program — which would allow homeowners to more easily add an apartment unit — is based on similar arrangements in states such as California. In Boston, added apartments would be restricted to a carved-out space within the confines of the home, including basements and attics, and only owner-occupied homes with up to three units would be eligible. Condominiums would not qualify, nor would attached or detached structures outside a house — such as garages or cottages. The program — which still needs zoning commission approval — would be tested for 18 months and launch in the rapidly gentrifying neighborhoods of East Boston, Jamaica Plain, and Mattapan. Marcy Ostberg, director of the city’s Housing Innovation Lab, said at a recent meeting that those neighborhoods were picked for different reasons: East Boston because of the proliferation of illegal rental units, Jamaica Plain because of tenant displacement, and Mattapan because there are more single-family homes with yard space. City housing officials said the program is in line with Walsh’s goal of building 53,000 new housing units by 2030. They are still working on the particulars of the proposed zoning language, and hope to seek approval from the zoning commission in November. Because of the upfront cost of building an apartment in an existing home, Ostberg said, the likelihood that the pilot program would yield more than 50 new units “is very, very low.” Housing officials are also considering a no-interest home equity loan program that would provide up to $30,000 toward needed renovation work. To qualify for such borrowing, homeowners would have to agree to charge below-market rents. Officials said the program would also provide amnesty to homeowners who illegally rent apartments that aren’t in compliance with city safety standards, in the hopes they come forward. That would allow officials to add them to the city’s rental registry, and to make sure the spaces are up to code. “We need a lot of different options to fix the [housing] problem,” Ostberg said. Susan Pranger, a 29-year resident of Jamaica Plain who attended the recent meeting to discuss the program, believes it “has a lot of promise, [but] they still have a few bugs to work out.” Pranger, 64, said she likes the idea of receiving extra income to stay in the neighborhood.